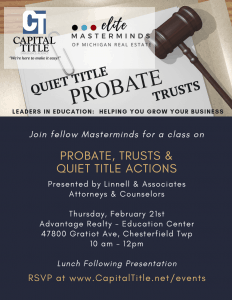 Join your fellow Elite Masterminds and Capital Title as you learn about Probate, Trusts and Quiet Title Actions with Linnell & Associates, Attorneys & Counselors. Lunch provided immediately following presentation. Location is the Training Center located in the lower level of Advantage Realty in Chesterfield Twp.